Passing food and drinks from hand to hand, participants called out to people walking by, “Is anyone hungry? Is anyone thirsty?” and leaped up to distribute water, dates, baklava and other traditional fast-breaking items. As the meal wrapped up, young men toting large garbage bags chanted, “Trash! Trash! Trash!” as they worked their way through the crowd collecting refuse. Ramadan, the month when observant Muslims traditionally fast from dawn till dusk, ended this year on August 7, but not before coming against a backdrop of weeks of street protests in Istanbul and elsewhere in Turkey. The very iftar meal that breaks the day’s fast became a forum for Turkish people to express their dissatisfaction with the direction they feel the country is taking. “Ramadan used to be a time for community, for people to come together and get to know each other, but with rapid urbanization and the social isolation that’s come with that, people have started to [either] stay in their homes for iftar or attend expensive [fast-breaking] meals at restaurants or hotels,” says Abdurrahim Özer, a member of the Anti-Capitalist Muslims. This loosely organized group of pious activists has coalesced in opposition to what they see as the too-close relationship between religion and wealth under Turkey’s current government. Two years ago, members of the group organized small public meals during Ramadan outside of luxury hotels where local dignitaries, business leaders and celebrities often host and attend lavish iftar dinners. Just one fast-breaking meal at a top hotel can cost nearly a quarter of the monthly minimum wage. Much food is often wasted during Ramadan, and many people (up to 25% of Turks, according to one recent news report) actually gain weight during the fasting month. "Ramadan “shouldn’t be about eating expensive foods; it should be about understanding and helping the poor, the hungry, the needy,” Özer says. 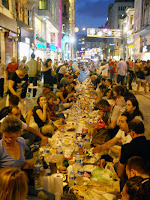 Following the first people’s iftar this year on İstiklal Caddesi, a thoroughfare that has hosted regular protests this summer, yeryüzü sofrası spread throughout the city, with individuals and groups organizing them each night in different locations – often places with symbolic importance due to conflicts in the area or threats facing historic heritage. After a public forum related to the ongoing protests was attacked by people with sticks and knives in the Kocamustafapaşa neighborhood of Istanbul, a communal iftar was held in the area the next night, drawing more than 1,000 people. Another was organized inside the Yedikule bostan, a series of centuries-old market gardens around the city walls that are in the process of being razed to build a landscaped park with tea gardens and an artificial river. Outside of Istanbul, a yeryüzü iftarı was held along the banks of the Tigris River in Hasankeyf, an ancient town in Southeast Turkey that faces being submerged under the waters of a hydroelectric dam. The people’s iftars are part of a tradition that predates Islam itself, according to Özer. “This goes back to the Prophet Abraham, who shared his food with other people who sat around his table,” he says. During Ottoman times in Turkey, “rich people would open their homes for the iftar meal,” says Mary Işın, the author of the recent book Sherbet and Spice: The Complete Story of Turkish Sweets and Desserts, and a writer on Turkish culinary history who has lived in the country since 1973. “They made huge amounts of food, mostly for friends and neighbors and colleagues, but theoretically anyone could turn up and be fed.” The sultan’s palace may have done similarly, if reports by foreign observers documenting life in Istanbul at the time are accurate. That tradition has morphed in recent years into massive municipality-organized iftar tents set up in central locations around Turkish cities to offer free meals to the public, but members of Özer’s group and their allies are critical of the way such charity has been commercialized. The elements of the iftar meal in Turkey have changed relatively little over the centuries. Many people still have a date – believed to be the preferred fast-breaking food of the Prophet Mohammed – as their first bite of sustenance after abstaining from dawn to dusk. This article was originally published on Zester Daily (RIP) on 13 August 2013.